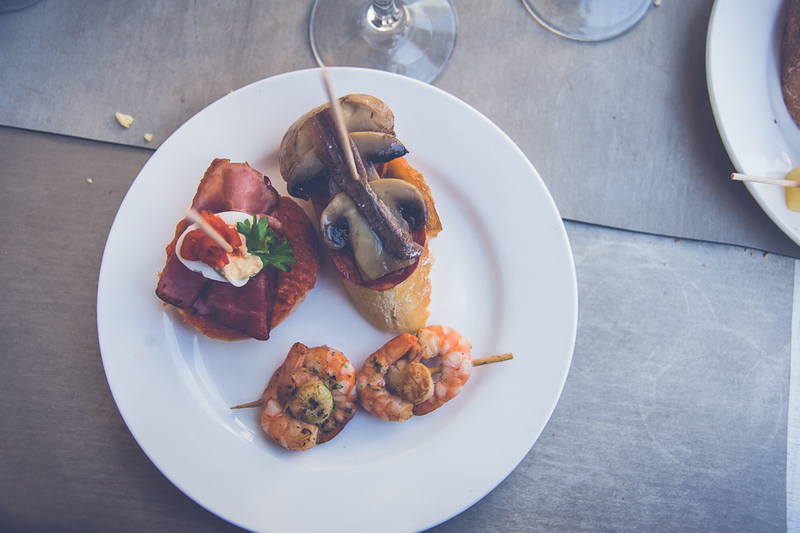 Tapas are what makes eating out in Spain pure magic. 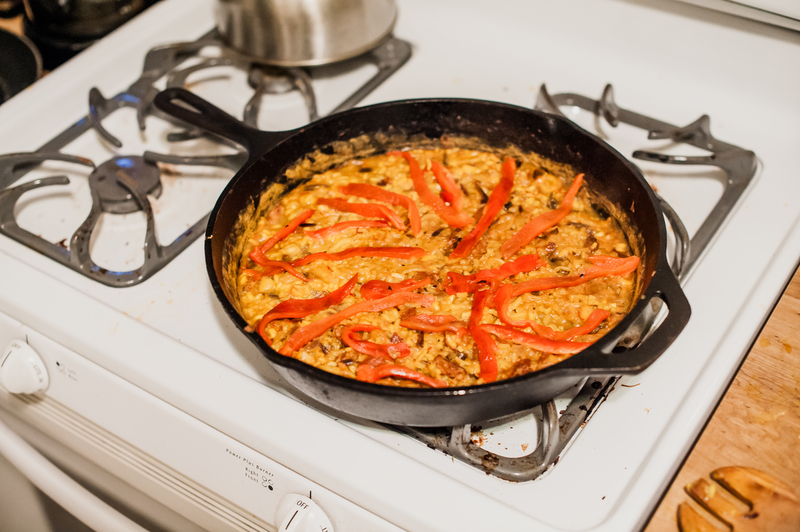 They are well known in the United States with a growing list of restaurants offering tapas on their menus. 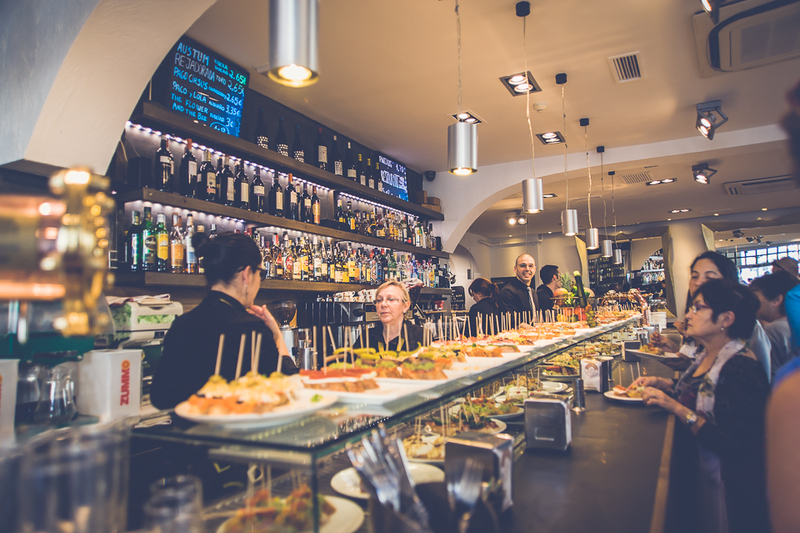 But where tapas in the U.S. may be little more than overpriced appetizers on small plates, in Spain they are a pairing with simple, fresh food, a conversation starter, a non-pretentious way to connect with your friends and neighborhood. Sometimes they are free with your drink, though they can get expensive in a hurry if you don’t watch what you order. There are few things that bring more joy to a hungry person in Spain than walking into a restaurant and seeing the glass case on top of the bar full of tapas – tortilla (Spanish omelet with potatoes, onions and garlic), fried calamari, slices of serrano ham, gambas al ajillo (shrimp in garlic sauce), sautéed mushrooms, roasted green peppers, tiny little fish called boquerones gently drizzled with olive oil, salt and lemon juice that will make you swear off canned sardines and tuna forever. Your view of all that food on the bar is blocked by still more tapas sitting on top of the glass case. 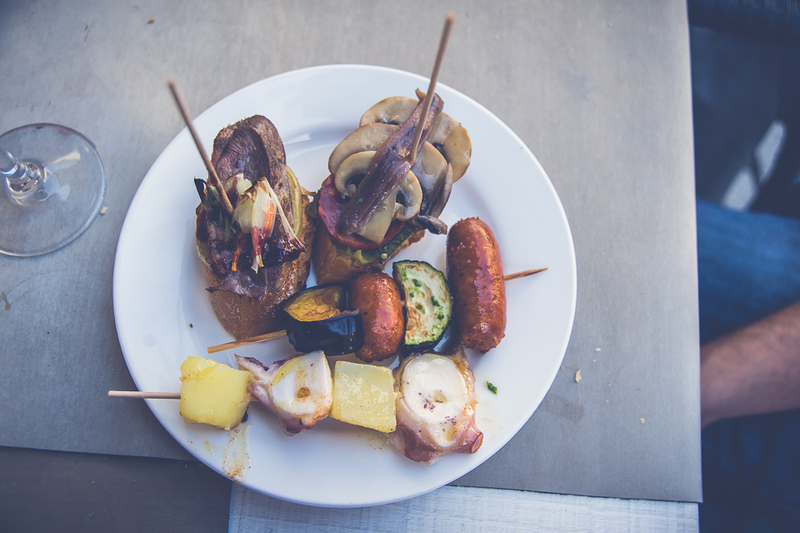 They may be stacked on a piece of bread and skewered with a toothpick: this is the pincho. It may be as simple as a piece of ham, fish or vegetable skewered on to a sliced of bread spread with olive oil. Or they may be complex, with big flavors and colors jumping off your plate. A string of bars in San Sebastian’s old quarter boasts rows of pintxos each built into a Babel’s Tower of complex layers, one on top of another: a sharp Manchego cheese spread; house-made pâté; roasted red peppers; fried fish; salmon mousse with chopped almonds; roasted shrimp atop a puff of pureed shrimp paste; chorizos; cheeses. And how do you know how much it all costs? They just count the toothpicks. On a recent episode of CNN’s travel-cooking-adventure show Parts Unknown, chef-storyteller Anthony Bourdain traveled to Granada in Southern Spain to celebrate (and tease) his cameraman and director of photography, an American, who was about to wed a Spanish girl and marry into the crazy, relaxing, wild, contradictory and exhilarating life that is Spanish culture. They argued, over tapas and drinks, about whether the tapas culture could really work in United States. Yes, said the cameraman. No, said Bourdain. There is too much hurry. 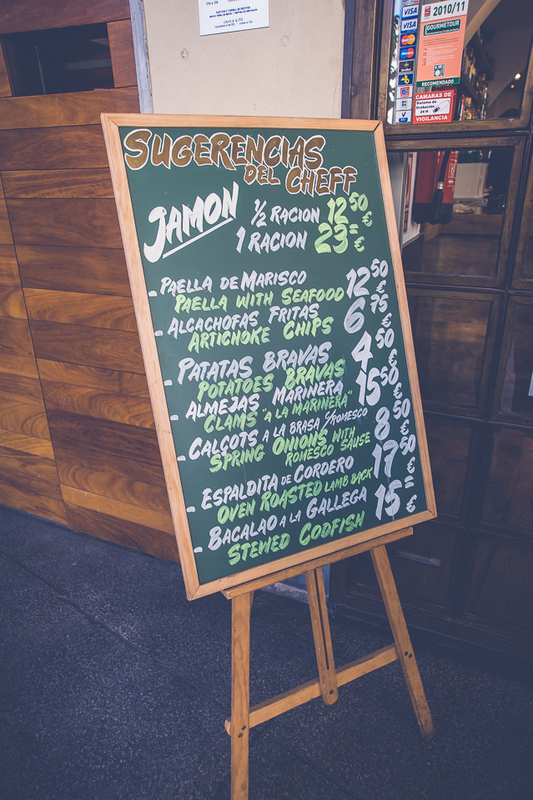 The cost structure and razor-thin profit margins of restaurants would never tolerate giving tapas for free or cheap to patrons ordering drinks. Just look at the tapas on the menu of any U.S. restaurant serving traditional Spanish, Spanish fusion, pan-Latin American, Asian-Latin-Euro Contemporary Whatever cuisine: Free tapas? Not likely. Anything more than a few slices of cheese and olive for less than five dollars? Difficult, in part because the U.S. restaurant business cannot sustain it and the American culture cannot support it. To really understand the whole point of tapas and pintxos is to understand the neighborhood bar. While a student in Madrid (and still under 21 years of age) many years ago, I was amazed to see at least one bar on every block. Some were the size of a closet, while others were grand salons over several floors. Many were mid-size spaces with a long bar, tables and chairs, and more tables and chairs on the sidewalk outside. 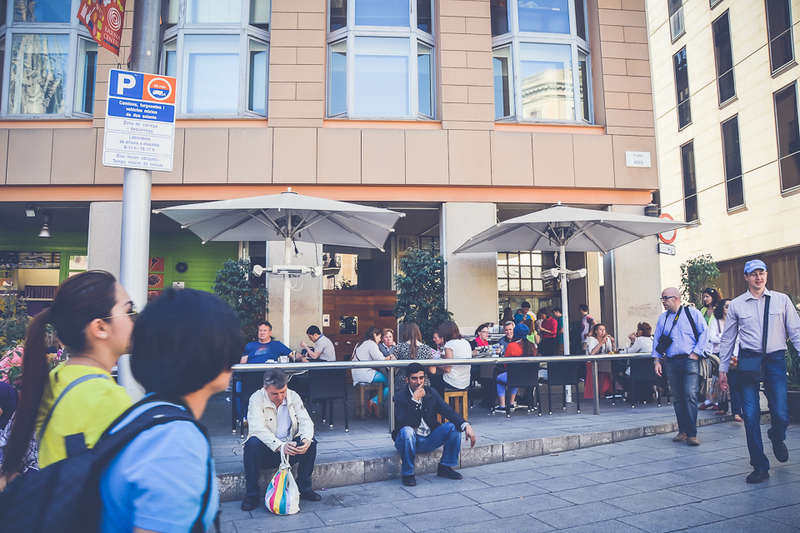 Frequently I saw so many crowded tables on sidewalks, plazas, and even in the streets that I could not easily tell where any of the actual restaurants were located. A bar is not like a U.S. standalone “bar”, a local joint that might have dark interiors, vinyl booths, pool and darts, local drunks, college kids with fake IDs, and popcorn. 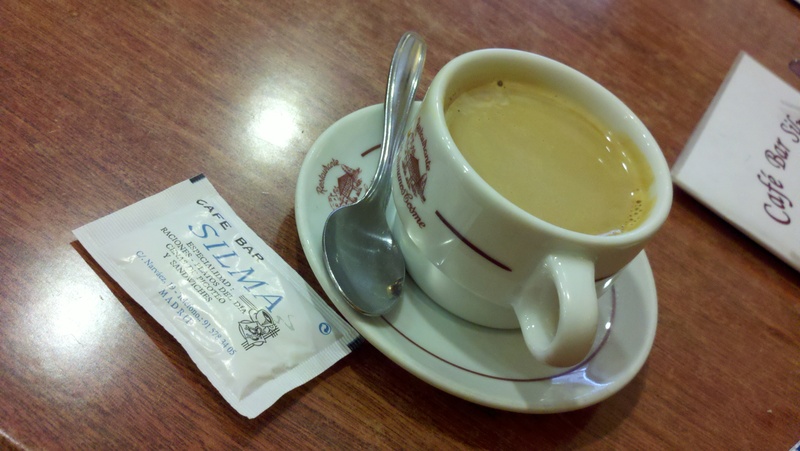 The Spanish bars served café con leche in porcelain cups with toast and croissants in the morning. Tapas all day. Beer and wine. Desserts. A glass of water? Chance are your water won’t be accompanied by the bartender’s scowl for not getting a tip. Many bars serve families with kids. The line blurs between “bar” and “restaurant”. The culture of drinking is not a culture of fear; alcohol is not hidden behind a veil of shame from potential underage drinkers. Still, in Spain just as elsewhere, too much is too much. 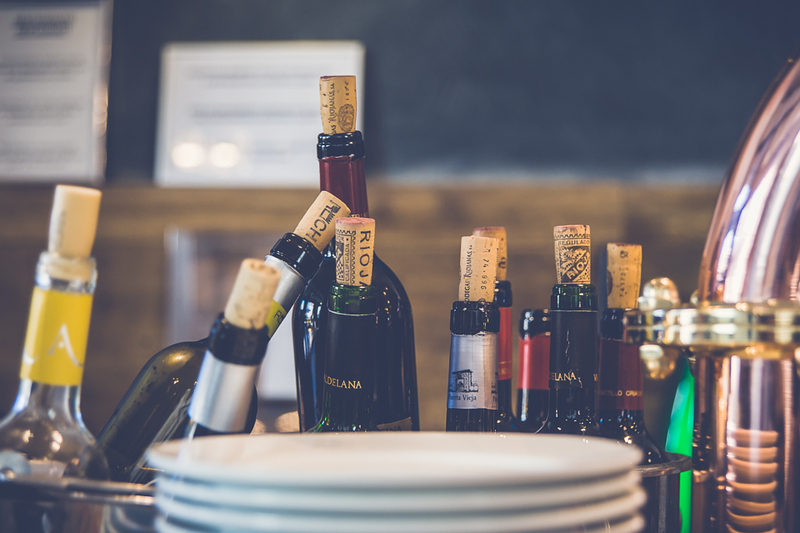 When my mother visited me in Spain years ago, she remarked on the number of men she saw who showed the telltale signs of advancing alcoholism. And then there’s Anthony Bourdain. “Twice,” he answered sheepishly. “One and a half.” Laughs all around. And yet, the relaxed attitude is as refreshing as a glass of cold, light, fizzy Cruzcampo beer on a blistering hot summer day in Andalucía while sitting in a bar to escape the sun’s glare off the town’s white walls. 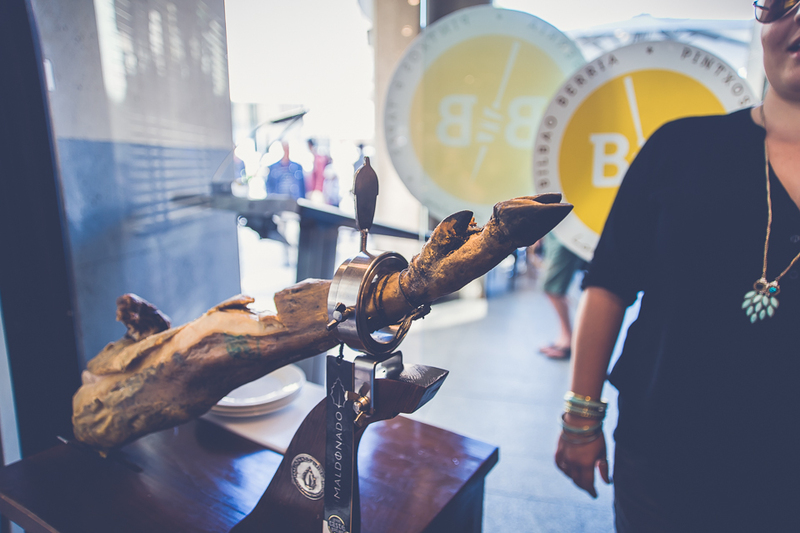 Much like Bourdain discovered, Spain could not exist without its contradictions. Pintxos are one of those uniquely Spanish things that wait to get under your skin until after you’ve been in Spain for a while – after you’ve done the right touristy things, those which present themselves to outsiders first: paella, flamenco, tapas. 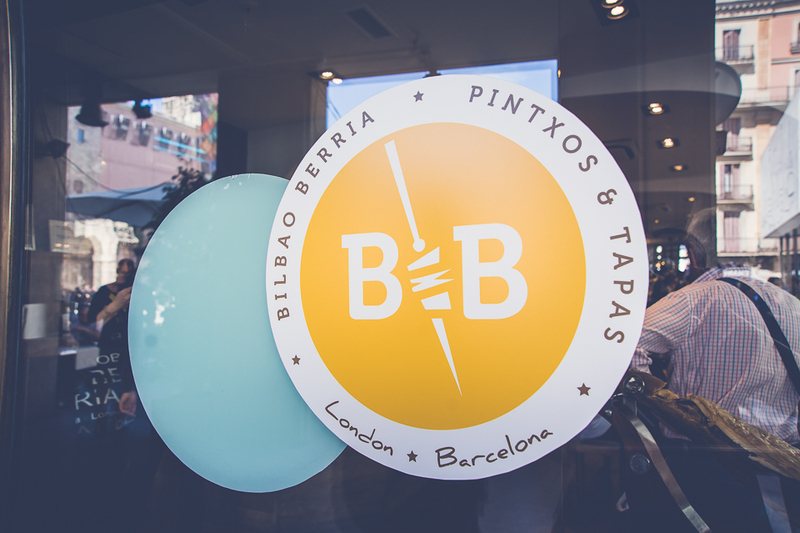 But pintxos are different and more: a variation on the theme of tapas, a window on the subtle yet life-changing linguistic differences in Spain, a taste of how fiercely regionalism can trump national identity, and a reminder, finally, of just how hungry you are right now. 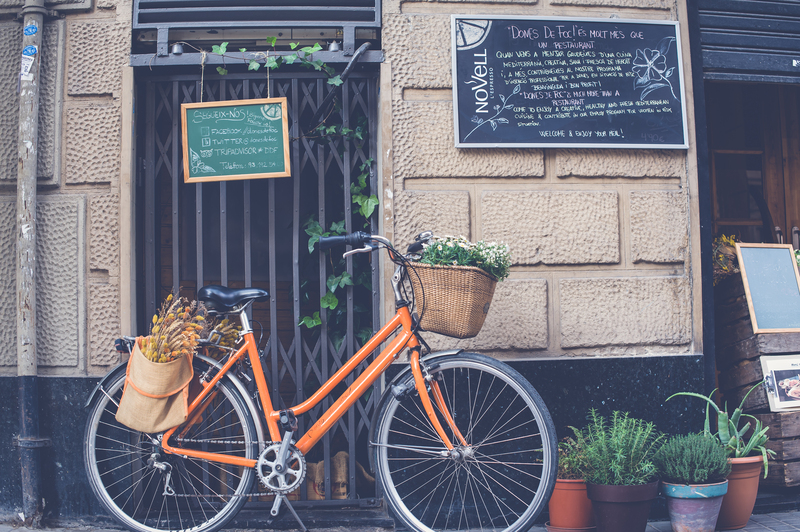 In the same way that it is risky to shop at a supermarket while hungry, so it is to wander through a tapas or pinchos or pintxos bar while famished. This is not a bad thing. 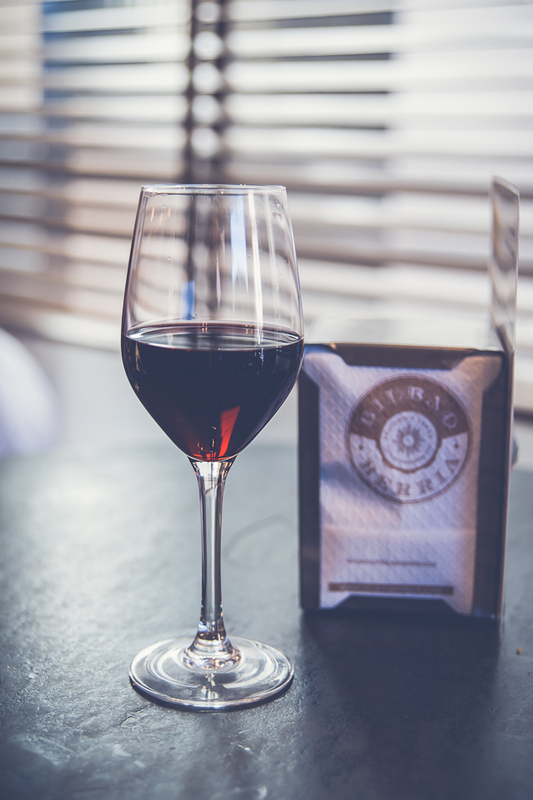 Once you’ve gotten a chance to relax, sip your wine more slowly, and get to know locals and customs, the pintxos creep in and establish themselves in your mind. Just like tapas, served to accompany your wine or caña (small glass of beer) that you toss back before following your friends to the next bar next door. The writer makes Spain and its culture come deliciously alive. And the photos guarantee that travel to Spain is in the future to witness it all in person. Where will this Blog take us next? ¡¡Mmm…qué ricas se ven!! ¡Ya me dieron hambre!